I have with me, right now, a very pregnant little dachshund. She sort of belongs to one of my neighbors who was (is) looking for a home for her. I said no when asked. Then I found out she was pregnant, and that she had been pregnant before, and that those puppies had either died or been killed by mama. I almost immediately went over and got her. 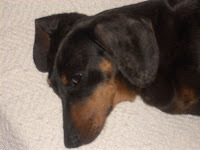 But not before I got on the web and looked up some dachshund people to ask for help. To make a long story short, I have found a dachshund rescue person not far from here who is willing to take Sugar (the pregnant dachshund), supervise the pregnancy and birth, take care of all their health needs (mama and babies), and then find good homes for them. I seem to recall that she said she already has a home for the mama. 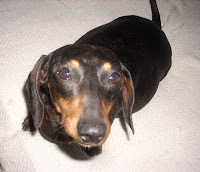 Tomorrow I will be driving Sugar half way to Dream-a-Dream Dachshunds in Pflugerville, Texas. Sherry, the person who runs Dream-a-Dream, will be meeting me half way. I think these are going to be very cute puppies. I'm almost 100% sure that the daddy is a pure-bred pug, so these puppies will be "Dugs." Or I suppose they could be "Pugsies" (for pug and doxie). Sherry will be keeping me informed about Sugar and her puppies, and will send pictures. I'll report here when I hear something. Sugar is a very sweet little dog, and she deserves a permanent home where she's part of the family. That's not what she had here at her previous home. Oh, the temptation is keeping her myself. The reality is that I have enough pets and wouldn't be able to give her the time or care that she needs. Darn it. Don't let the pix fool you. She has a LOT of energy. It was awhile before I could get her to keep still so I could snap these photos.